My name is Abby Huggins Mowinski, DVM and I am a small animal veterinarian, practicing in Atlanta, Georgia. I am also a mom of pets and boys, a wife, an adjunct professor, and a competitive endurance athlete. As a veterinarian, I have long advocated optimal nutrition, healthy body condition, and an active lifestyle as being tantamount to my patients’ overall health. One of a vet’s many roles is to offer guidance to owners as they wade through the sea of dietary options for their pets at all life stages. I was first introduced to Nulo in 2016 at Ironman 70.3 Augusta, an endurance triathlon race, when I found a dog food sample in my pre-race bag. At the time, I was focused on the race, but upon returning home, I researched the brand and was immediately impressed with Nulo’s product and philosophy (our dog Tesla was also quite enamored – she ate the sample with reckless abandon). From a nutritional standpoint, Nulo hits the nail on the head with its protein-forward, low carbohydrate, no-filler formulation. As a former collegiate swimmer for Duke in the 90s and now a world championship qualifying triathlete, I have been preaching this dietary ratio to pet parents for the past 18 years. High protein:low carb ratio not only promotes a healthy, lean, muscular body condition but, more importantly, most closely resembles what these animals were naturally designed to eat. To have a pet food company dedicated to the same philosophy I use to feed myself and my family – that the fuel you supply the engine with is one of the most important decisions you can make on a daily basis – is incredibly exciting. It is important for me to fuel myself appropriately because I have goals – goals as a parent to set a healthy example for my boys, goals as a professional to be at my best for all of my patients, and goals as a triathlete and trail runner to be as competitive and successful as possible. I race because I enjoy it (admittedly, I love to find my way to the podium), but I also race in the hopes that I can inspire others to push themselves past their perceived limitations. Everyone is capable of self-improvement, and triathlon is an excellent showcase for improvement, as there are three distinct disciplines that the athlete has the opportunity to work on. For me, the combination of swim-bike-run is exhilarating. I have been fortunate in the sport to be rather competitive, despite starting just a few years ago. It is hard for me to decide which distance is my favorite (Sprint, Olympic, or Half Ironman); each offers its own version of physical and mental challenge. The sprint is typically just over an hour of racing, but the athlete is pushing at his max throughout, whereas the half Ironman distance (70.3 miles: 1.2 mi swim; 56 mi bike; 13.1 mi run) is a different beast of physical endurance and mental tenacity. Building a competitive race season takes time, sacrifice, and perseverance, as well as careful planning. But when you combine motherhood, professional life, and triathlon, the only guarantee is that you will never be in control. This year proved to be no exception. I entered this season still nursing a stress fracture and other injuries I hadn’t fully resolved. Add to that the devastating and unexpected loss of my father-in-law and lingering bronchitis for the entire family, it was unclear if my 2018 racing season would ever get off the ground. 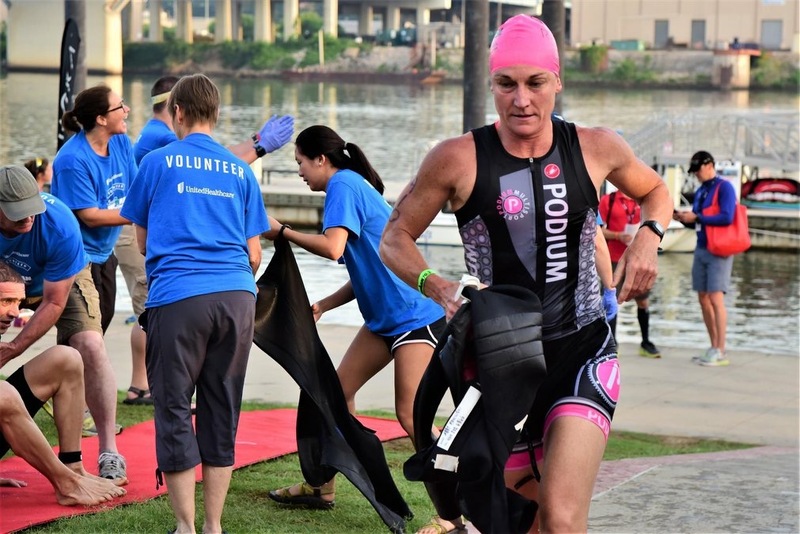 Despite an inconsistent start to my race season, by late spring, I had my momentum back with a number of podiums under my belt, including a 4th place age-group and 14th overall non-pro female finisher at Ironman Chattanooga 70.3, a half Ironman distance race with over 2000 participants. I was enthusiastic about what lay ahead and allowed myself to reopen many of the goals I had shelved. Then, in mid-June, I had my first “real” bike accident. I tend to be a very cautious and defensive rider in general, choosing only to cycle in closed parks with dedicated bike lanes. I was on a training ride at Stone Mountain, one of the more popular Atlanta cycling destinations, when a car in the left-hand lane abruptly decided to turn right, illegally crossing all the way across my lane. To avoid T-boning him, I hit the brakes hard at 20 mph. Time trial (TT) bikes don’t appreciate hard braking and I hit the deck at speed, using the length of my left side to decelerate. The force was enough to shear my bike shoe all the way down to my toes. Because it is a popular park, I was incredibly fortunate to have good Samaritans immediately at my side, including an unnamed EMT, who was training for a backpacking trip, and just happened to have a fully loaded medic backpack. She took over at time zero, cleaning all the grit and asphalt from my wounds at the scene and stabilizing me before the safety officers arrived. Also important to note, the driver did stop – he was not a bad person, just a lousy driver. The accident left me with a fractured wrist, bruised ribs, and some rather extensive road rash. However, looking at my helmet, it could have been so much worse. In the grand scheme of things, I was immensely lucky. While it hurt, it was more the shock of what happened and, more importantly, what could have been, that really shook me to the core. It’s easy to develop a fatalistic attitude after an unexpected setback – why not pack it up and call it quits? Much harder, however, is accepting that things don’t always go according to plan. Instead, you must find a way to manage your expectations and work toward a solution. And plenty of people make that hard choice every day – to keep moving forward. Lucky for me, I have amazing individuals in my life, both two- and four-legged, who serve as daily reminders of the strength of the spirit. At every race, I have a tradition of scrawling names in Sharpie across my left forearm. These names belong to people, and sometimes pets, to whom I am dedicating the race. This year, the name Keren has tatooed my arm at every event. Keren is a friend and classmate of my eldest son and, at the age of 10, is battling pediatric cancer. This brave young lady is such an incredible source of inspiration for me. She has undergone chemo, radiation, and a below-the-knee amputation – and has endured it all with grace, strength, and positivity. I also have a secret weapon – Tesla – my indefatigable training partner on four legs. She is always ready to go, ready to head out the door, regardless of the weather, the hour, or the day of the week. And she won’t take no for an answer. My boys named her Tesla, after we all decided that Energy Girl was too much of a mouthful. And she lives up to that name on a daily basis, with her boundless, rechargeable energy. In the veterinary profession, we often remark on how similar our patients are to their owners. Sometimes it’s attitude, sometimes it’s appearance…sometimes it’s even a shared medical diagnosis. I am a firm believer that our pets choose us, not the other way around. Each has a very special assignment during the time that they grace our lives – perhaps to teach us a lesson, fill a void, challenge us, or to support us. Tesla has filled a number of those roles. She is an intense dog – either firing on all cylinders at once or fast asleep. She is also an armored tank of a dog, seemingly impervious to pain or fatigue. If she doesn’t get her daily dose of exercise, she is miserable – and can make everyone around her miserable as well. Relentless when she has a goal in sight, in her case, a chipmunk or a mole, she tunes out the rest of the world and focuses solely on her prime objective. Don’t stop, won’t stop – those that know me best joke that I have met my match. Returning to training and competition after the accident hasn’t been easy, but it hasn’t been impossible. When you are a mom and a professional, life just keeps moving forward, regardless if you can keep up or not. So you keep up. Since the accident, fear has curtailed most of my outside bike training. Cycling can be a lonely pursuit, especially when the miles click away indoors on the trainer. But Tesla faithfully joins me in the basement, lying by my trainer as I pedal to nowhere – my constant companion. Dogs live in the moment – they seize every opportunity that is presented to them. The sound of the leash being taken off its hook on the wall results in instant Tesla euphoria. She reminds me to take advantage of the present – and to receive it with boundless enthusiasm. To live life fully, in each given moment. When I was recovering, she didn’t care if our daily walks were much slower and shorter than usual; she didn’t blame me that we couldn’t go for runs. Tesla was just happy to be outside with her person. With Tess by my side and the support of my family, friends, and teammates, as well as my amazing physical therapist, I was able to salvage my season. Although my body is not back to its former self yet, my cumulative fitness was enough to carry me through. 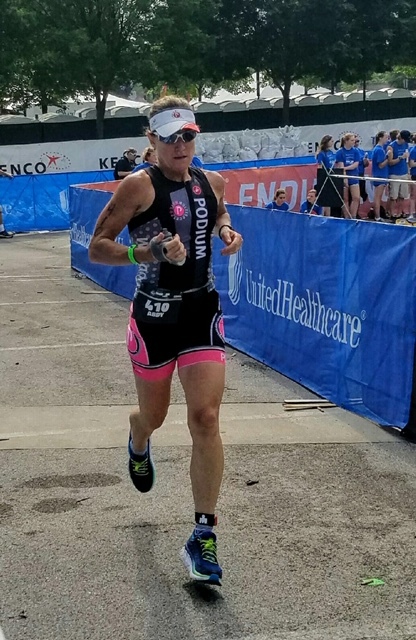 In addition to a number of overall podium finishes at local races and All-American honors, I was lucky to earn a spot on Team USA for Standard (Olympic) Distance World Championships in Lausanne, Switzerland in 2019, as well as an opportunity to compete at Ironman 70.3 World Championships next summer in Nice, France. The two races are one week and 300 miles apart, which will be an amazing trip and experience. While Tesla can’t join me there, I know she will be by my side through all the preparation, just as she is every day. A new year, a new goal. 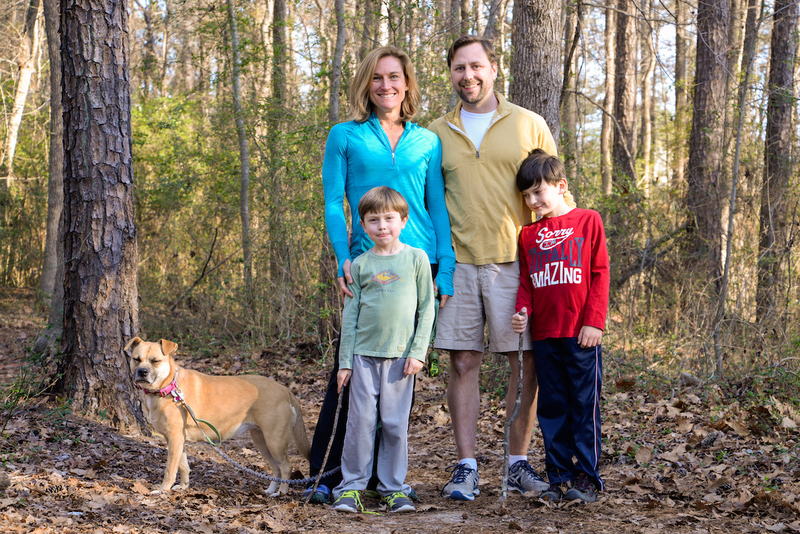 Lovable mixed-breed McCormack shares the story of how he found his way into the lives and hearts of Ironman Triathletes Chris and Jen Rulon.